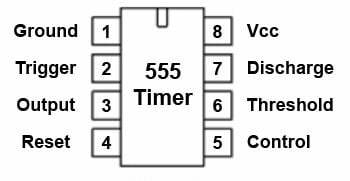 The 555 timer was introduced over 40 years ago. Due to its relative simplicity, ease of use and low cost it has been used in literally thousands of applications and is still widely available. 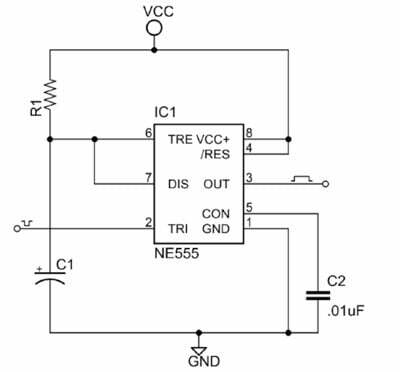 Here we describe how to configure a standard 555 IC to perform two of its most common functions - as a timer in monostable mode and as a square wave oscillator in astable mode. Figure 1 shows the input and output signals of the 555 timer as they are arranged around a standard 8 pin dual inline package (DIP). Pin 1 - Ground (GND) This pin is connected to circuit ground. A low voltage (less than 1/3 the supply voltage) applied momentarily to the Trigger input causes the output (pin 3) to go high. The output will remain high until a high voltage is applied to the Threshold input (pin 6). In output low state the voltage will be close to 0V. In output high state the voltage will be 1.7V lower than the supply voltage. For example, if the supply voltage is 5V output high voltage will be 3.3 volts. The output can source or sink up to 200 mA (maximum depends on supply voltage). A low voltage (less than 0.7V) applied to the reset pin will cause the output (pin 3) to go low. This input should remain connected to Vcc when not used. You can control the threshold voltage (pin 6) through the control input (which is internally set to 2/3 the supply voltage). You can vary it from 45% to 90% of the supply voltage. This enables you to vary the length of the output pulse in monostable mode or the output frequency in astable mode. When not in use it is recommended that this input be connected to circuit ground via a 0.01uF capacitor. In both astable and monostable mode the voltage across the timing capacitor is monitored through the Threshold input. When the voltage at this input rises above the threshold value the output will go from high to low. This is is the positive supply voltage terminal. The supply voltage range is usually between +5V and +15V. The RC timing interval will not vary much over the supply voltage range (approximately 0.1%) in either astable or monostable mode. Figure 2 shows the basic 555 timer monostable circuit. Figure 2: Basic 555 monostable multivibrator circuit. Referring to the timing diagram in figure 3, a low voltage pulse applied to the trigger input (pin 2) causes the output voltage at pin 3 to go from low to high. The values of R1 and C1 determine how long the output will remain high. Figure 3: Timing diagram for 555 in monostable mode. During the timing interval, the state of the trigger input has no effect on the output. However, as indicated in figure 3, if the trigger input is still low at the end of the timing interval the output will remain high. Make sure that the trigger pulse is shorter than the desired timing interval. The circuit in figure 4 shows one way to accomplish this electronically. It produces a short duration low going pulse when S1 is closed. R1 and C1 are chosen to produce a trigger pulse that is much shorter than the timing interval. Figure 4: Edge triggering circuit. As shown in figure 5, setting pin 4 (Reset) to low before the end of the timing interval will stop the timer. Figure 5: Resetting the timer before the end of the timing interval. Reset must return to high before another timing interval can be triggered. 1. First, choose a value for C1. 2. Next, calculate the value for R1 that, in combination with C1, will produce the desired timing interval. Avoid using electrolytic capacitors. Their actual capacitance value can vary significantly from their rated value. Also, they leak charge which can result in inaccurate timing values. Instead, use a lower value capacitor and a higher value resistor. 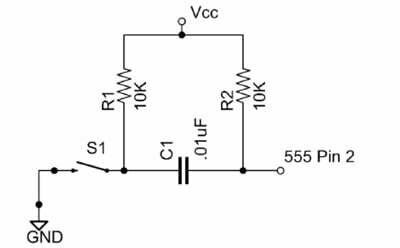 For standard 555 timers use timing resistor values between 1K ohms and 1M ohms. Figure 6 shows a complete 555 monostable multivibrator circuit with simple edge triggering. Closing switch S1 starts the 5 second timing interval and turns on LED1. At the end of the timing interval LED1 will turn off. During normal operation switch S2 connects pin 4 to the supply voltage. To stop the timer before the end of the timing interval you set S2 to the “Reset” position which connects pin 4 to ground. Before starting another timing interval you must return S2 to the “Timer” position. Figure 6: Complete 555 timer circuit reset switch. Figure 7 shows the basic 555 astable circuit. Figure 7: Basic 555 astable multivibrator circuit. In astable mode, capacitor C1 charges through resistors R1 and R2. While the capacitor is charging, the output is high. When the voltage across C1 reaches 2/3 of the supply voltage C1 discharges through resistor R2 and the output goes low. When the voltage across C1 drops below 1/3 of the supply voltage C1 resumes charging, the output goes high again and the cycle repeats. The timing diagram in figure 8 shows the 555 timer output in astable mode. Figure 8: 555 timer in Astable mode. As shown in figure 8, grounding the Reset pin (4) stops the oscillator and sets the output to low. Returning the Reset pin to high restarts the oscillator. Calculating the period, frequency and duty cycle Figure 9 shows 1 complete cycle of a square wave generated by a 555 astable circuit. Figure 9: Astable square wave one complete cycle. where T is the period, in seconds. or, using the formula below, you can calculate the period directly. Where f is in cycles per second or hertz (Hz). However, you really just need to know the values of R1 and R2 to calculate the duty cycle. C1 charges through R1 and R2 but discharges through R2 alone so duty cycle will be greater than 50 percent. However, you can obtain a duty cycle very close to 50% by choosing a resistor combination for the desired frequency such that R1 is much smaller than R2. The smaller R1 is compared to R2 the closer the duty cycle will be to 50%. To obtain a duty cycle that is less than 50% connect a diode in parallel with R2. 2. Calculate the total value of the resistor combination (R1 + 2*R2) that will produce the desired frequency. 3. Select a value for R1 or R2 and calculate the other value. For example, say (R1 + 2*R2) = 50K and you select a 10K resistor for R1. Then R2 must be a 20K ohm resistor. Then divide the result by 10 or greater to find the value for R1. Figure 10 shows a 555 square wave oscillator with a frequency of approximately 2 Hz and a duty cycle of approximately 50 percent. When SPDT switch S1 is in the "Start" position the output alternates between LED 1 and LED 2. When S1 is in the "Stop" position LED 1 will remain on and LED 2 will remain off. Figure 10: Complete 555 square wave oscillator circuit with start/stop switch. The standard 555 has a few characteristics that are undesirable for battery powered circuits. 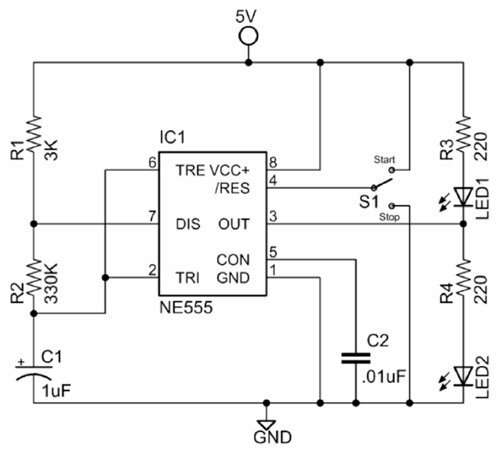 It requires a minimum operating voltage of 5V and relatively high quiescent supply current. During output transitions it produces current spikes of up to 100 mA. 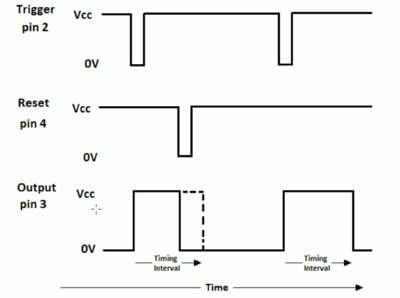 Additionally, its input bias and threshold current requirements impose a limit on the maximum timing resistor value, which limits the maximum time interval and astable frequency. Low power CMOS versions of the 555 timer, such as the 7555, TLC555 and the programmable CSS555, were developed to provide improved performance, especially in battery powered applications. They are pin compatible with the standard device, have a wider supply voltage range (for example 2V to 16V for the TLC555) and require significantly lower operating current. They are also capable of producing higher output frequencies in astable mode (1-2 MHz depending on the device) and significantly longer timing intervals in monostable mode. These devices have low output current capability compared to the standard 555. 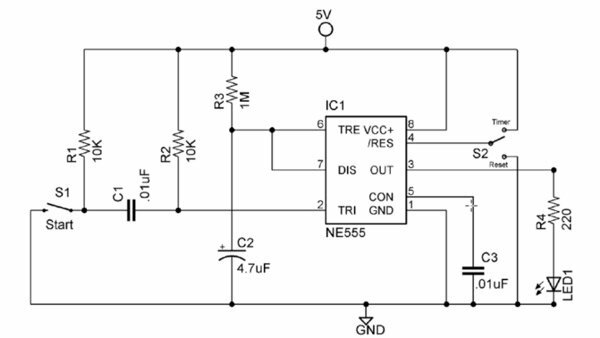 For loads greater than 10 – 50 mA (depending on the device) you will need to add a current boost circuit between the 555 output and the load. 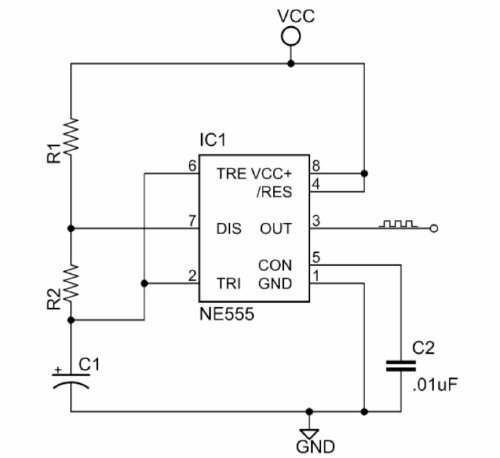 Consider this a short introduction to the 555 timer. For further information be sure to study the manufacturers data sheet for the specific part that you are using. Also, as a quick Google search will verify, there is no shortage of information and projects devoted to this IC on the web. For example, the following web site provides more detail on both standard and CMOS versions of the 555 timer. For almost two decades, Phil Kane has been a technical writer in the software industry and occasionally authored articles for electronics enthusiast magazines. He has a bachelor's in Electronics Engineering Technology with a minor in Computer Science. Phil has had a life-long interest in science, electronics and space exploration. He enjoys designing and building electronic gadgets, and would very much like to see at least one of those gadgets on its way to the moon or Mars one day.